If you are French, or have a penchant for good French patisserie, you might want to look away now. If my telling you that my favourite place to buy croissant is Costco makes you feel all faint, this post is not for you. No, I have not found a local bakery I love yet (alright, Greggs excepted – sorry, I love sausage rolls) so if I find myself hanging out with my mum at Costco, I always come home with a lovely tray of their 12 huge croissants laid out on corrugated cardboard and wrapped in stretchy cellophane. I bag them up in 3’s or 4’s depending on my mood and put some in the freezer (if this shocks you, don’t blame me, I did warn you :P). I’ll ramble on a little more, just in case one of you fainted before you managed to click away and have just come to. You won’t want to see the photo below. Although, if you are reading this on a large screen, I’m sorry, I hope you’ll forgive me this once. I decided to start a little series and see how long it will run for. I’m calling it Tasty Toasties and it will nestle right in on my Tasty Tuesdays. I keep making grilled things on bread with whatever is in the fridge (usually there’s some cheese involved). I then take photos of them because I think I’m a bit obsessed. So I thought I’d share my obsession and start it with something fun. I’d had this tin of beans sitting in the cupboard since I don’t know how long. All I know is that the best before date was end of last month. So I figured I’d better consume it. 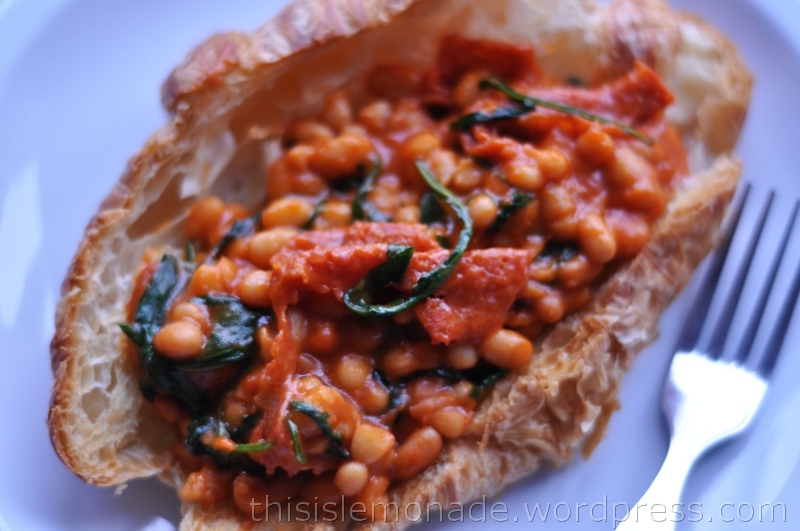 Not all in one go mind, because we all know that little ditty… beans, beans, they’re good for your heart……… I didn’t fancy sliced bread, but there were a couple of croissants from a recent defrost. And the following often happens when I am let loose in the kitchen. 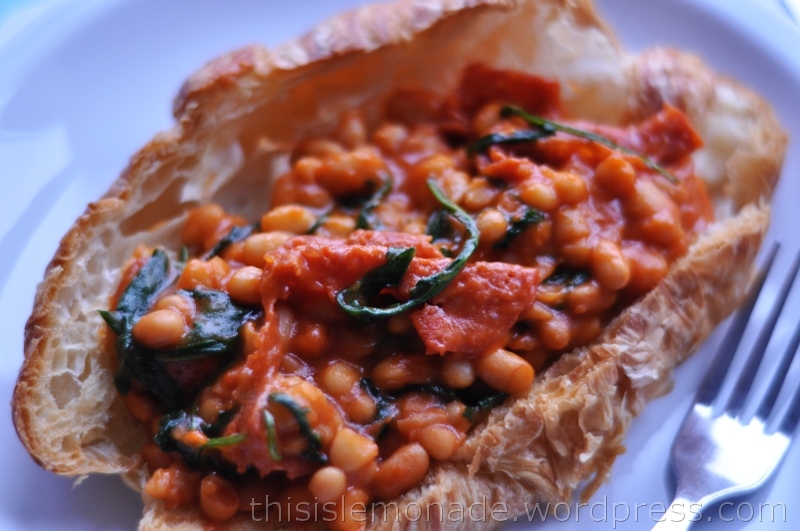 Categories: Food & Drink, Tasty Tuesdays | Tags: bakery, beans, brunch, chorizo, croissant, food, Greggs, grill, patisserie, photo, rocket, toast | Permalink. I grew up with French cuisine but the fact that you buy croissants at Costco and stuff them in a freezer doesn’t stop me from reading this post to the end. Their croissants taste more *French* than the local French bakeries around where I live. Yes, I buy croissants at Costco, too. I was so excited to see you posting this on Facebook – helloooo YUM alert! Tasty Toasties – love it. that actually looks pretty good! and I don´t really like beans! Yum! I also enjoy ‘pimping up’ beans on toast from time to time! And adding chorizo to anything = can’t go wrong!! True, chorizo is just magic 🙂 Beans are great too aren’t they? I love your new obsession! This looks wonderful and don’t hide because you can buy great bread at national chains! I have found many that I love. You are so funny and love to read your thought process. Though in the end I would have thrown that cheese on there anyway cause I am a cheese nut!